This is a python script that tries to connect on port 25 and performs automatic username enumeration through the vrfy command by supplying a .txt file with usernames. # This was written for educational and learning purposes only. # The author will be not responsible for any damage! 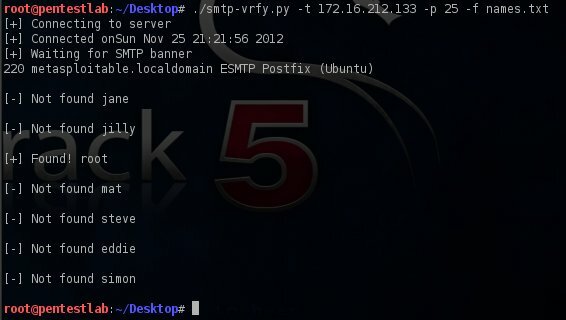 usage = "./%prog -t <target> -p <port> -i <inputfile>\nExample: ./%prog -t 74.52.252.187 -p 25 -f names.txt"
print "| SMTP vrfy enumeration scanner v0.5 |"
print "| by MrMe 07/2009 |"
print "| Special Greetz: krma |"
print "\n[-] Server timed out"
print "\n[-] There was an error with the server"
print "[+] Waiting for SMTP banner"
print "[-] This server is not vulnerable!" If you’re going to post a Python script, you might consider putting the PRE tags around it to preserve the formatting, especially since Python relies on indenting to delineate statements within each control block. Just a friendly suggestion.